cung cấp một giải pháp hoàn chỉnh cho các chuyên gia kỹ thuật thông tin liên lạc, có công cụ minh họa chuyên dụng, khả năng tương thích file hàng đầu, và khả năng xuất bản cho in ấn, trực tuyến và di động. Tạo dự án một cách nhanh chóng bằng cách truy cập và đặt lại mục tiêu thiết kế kỹ thuật tài sản từ các địa điểm khác nhau và các nguồn, bao gồm thiết kế 3D và các add-on tùy chọn cho định dạng lắp ráp 3D CAD *. trao đổi tập tin với các đồng nghiệp và khách hàng có khả năng xuất khẩu sang một phạm vi rộng lớn của hơn 100 định dạng tập tin, bao gồm cả WebCGM, .svg, .DWG, 3D PDF, .eps và TIFF. Create detailed illustrations and designs with confidence using dedicated technical illustration tools, graphic design and layout features, and professional image editing. Deliver high-quality, technical communication projects, including sophisticated documentation, detailed assembly instructions, user and maintenance manuals, and more. Access your critical data from various sources, including 3D designs and the optional add-on for exclusive 3D CAD assembly formats. Ensure all of your important technical files can be delivered in a readable format. With 3D visualization efficiencies, you can insert 3D models as linked or embedded objects into any technical illustration for instant access, sharing and reference. Export to a broad range of over 100 file formats, including WebCGM, .SVG, .DWG, .PDF, .EPS and TIFF, to easily exchange files with colleagues and clients worldwide. Publish your document as a 3D PDF or Lattice3D file format for instant sharing and publishing via online and mobile. Share your technical designs and documentation with a diverse set of cross-media publishing and distribution capabilities. Create illustrations with localized text for global technical publication with XLIFF support and publish S1000D compliant IETMs. Deliver 3D technical communication projects that feature 3D PDF and ISO standard PDF/A support. Publish to 3D PDF with interactive viewing of 3D content in combination with other visual and text elements. Export from Corel DESIGNER® to 3D PDF to generate output with all pertinent data and graphics in one document for cross-media publishing. 3D PDF files can be viewed with free PDF reader applications that are installed on almost any desktop or laptop computer. Choose one of two ways to insert a 3D model into a Corel DESIGNER document; either insert it as an external reference or embed the 3D model (XVL file) in the Corel DESIGNER document. When embedding the 3D file, the 3D model can be accessed for modifications within the Corel DESIGNER (.DES) file. You can then share the .DES file with other users who can access the embedded 3D file. Reach a worldwide audience with a new option that allows you to send text content from your graphics file in Corel DESIGNER to Translation Memory Systems (TMS) using XLIFF standard, and receive translated content from TMS. The translation results can then be imported into the existing document to create a new file for the specific language. With illustrations instantly available in multiple languages, companies can satisfy their global business needs. Expand beyond the standard 3D file support and take advantage of the automated 3D CAD to illustration update, with the optional Lattice3D Studio CAD add-on. Streamline the technical illustration process by accessing early 3D designs as a source file. Once the designs are updated, you can use an automated process, Auto Detection and Update, to implement the design changes engineering has applied to the original 3D source file. Lattice3D Studio CAD add-on also provides support for the native assembly and part file formats of high-end 3D CAD systems such as CATIA, SolidWorks, NX, Inventor, PTC Creo and many others. Plus, you can publish animated 3D visualizations as a 3D PDF or Lattice3D file format for instant sharing and publishing via online and mobile. Leverage the option of multiple displays, using one screen for illustration and 3D work, and one for documentation or additional tools. Advanced workspaces offer Lite for beginners, Technical for pros doing isometric illustrations, Diagramming for pros using flowcharts and diagrams, and the Adobe workspace for new Corel DESIGNER users coming from other applications. Capture your intended drawing shape with exactness using the new Outline Position options that recognize line width measurements for object dimensions. Use the new Alignment Guides so all elements of your technical illustration are intuitively, yet precisely, placed in their intended positions. 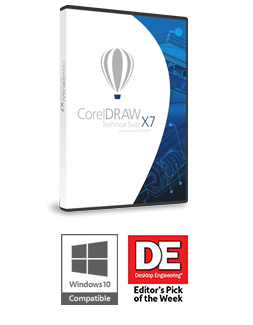 Speed up the creation of all kinds of technical graphics, from wiring diagrams to architectural designs with the new Parallel Drawing mode in Corel DESIGNER X7. You can simultaneously draw multiple parallel curves while controlling the distance between them. Use the Parallel Drawing toolbar to set the number of parallel curves to create and position them with precision.